Common Types Of Material For Welding! Channel iron (C-shaped or U-shaped). Flat bars or metal strips. Round stock and solid square stock. Plate steel. 1/2 inch thick. Sheet metal. 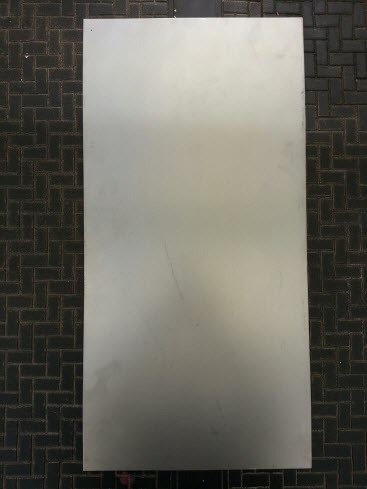 Mild steel sheet metal, stainless steel sheet metal, and aluminum sheet metal. High beam or H beam. It's used for structural welding like for buildings and bridges. You can get most of the same types of materials in aluminum which is not as easy to weld as mild steel. You will be probably starting off with mild steel if you are just starting out. 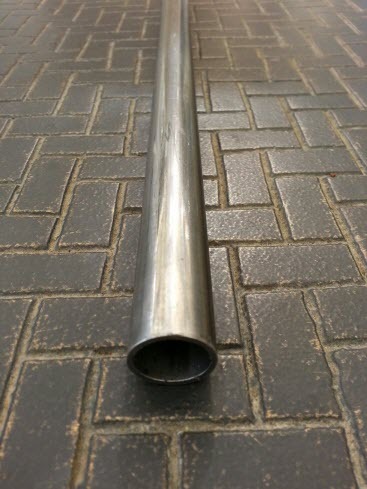 The most common square tubing a hobby welder is going to use in their garage is 1 x 1 inch square tubing. If you work out of your garage and you want to MIG weld some projects you're going to use a lot of square tubing. And if you are new to welding one of your first projects might be a welding cart to carry your MIG welder and cylinder. You'll be using 1 inch x 1 inch square tubing for that. The tubing pictured above is 1.25 inch square tubing. Aluminum has very sharp corners and steel has more rounded edges. Conversely, as steel gets more thick, the edges get more round. The reason that steel gets rounder as it gets thicker is as follows: steel tubing and pipe are formed by taking flat pieces of sheet metal. They are then bent into a square. Then the steel manufacturer takes a seam welder and welds the square tubing up. You can see a seem in the square tubing. The reason that the corners get more round on thicker steel is because the thicker it is the bigger the radius it needs in order to bend. The aluminum square tubing is created from a solid piece of aluminum. They take the solid piece and then put it through a dye which then produces the shape they desire, which in this case it is square tubing. There are no seams (no welds to be made) as a result. The reason they create aluminum tubing this way is because if they did it the same way as with steel the aluminum sheet metal will be too weak and it will brake. So this is the only way to do it. Rectangular Tubing: The image here is 1 inch x 2 inch rectangular tubing. 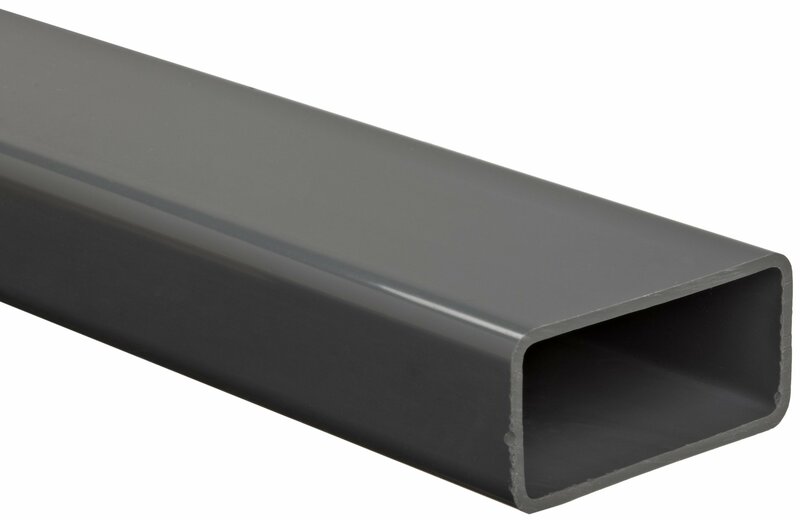 It is very similar applications as a 2 inch x 2 inch square tubing*. For example, you'll see pickup truck racks made from rectangular tubing and similar types of projects. 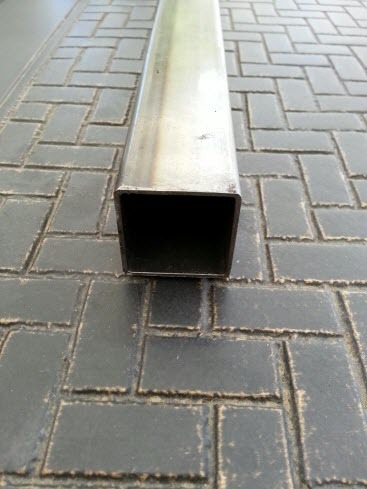 *2 inch x 2 inch square tubing (1/8th inch thick) is often used for racks for ladders, pick up truck racks, frames, tables, and other larger projects. Tubing and Pipe sound the same but they are not. The tubing is smaller than the pipe because pipe is measured by a nominal inside dimension, but the tubing is measured on the outside. The tubing pictured here is .75 inches on the outside. So if you found .75 inch pipe it will be larger because they measure pipe on the inside. 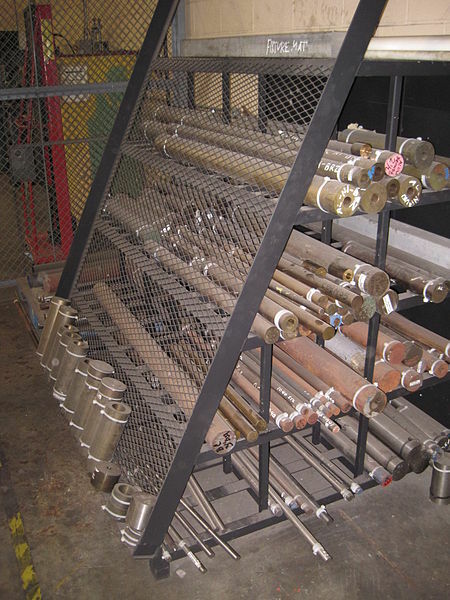 Pipe and tubing are used for similar projects as square and rectangular tubing. But the pipe sizes are designed for plumbing, mostly. However they can be used for structural projects. 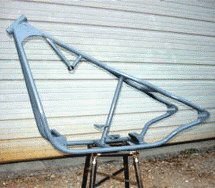 Angle iron is used almost as often as tubing because you can make many projects with it; frames, table legs, and much more. Angle iron is at a 90 degree angle, and you can get them in different lengths. For example you can get 3 inch x 4 inch, or .5 inch x 2 inch, etc. etc. You measure angle iron the same way you do with tubing. You measure it from the outside. In this example (see image) it's 1 inch x 1 inch and 1/8th inch thick. Solid stock is in round, square, rectangle, half circle, and other shapes. Solid stock is measured the same as tubing. The smaller, thinner, pieces (rounds and squares) are used quite a bit for ornamental and decorative welding projects. For example, if you heat up the material and twist it you can get a nice look to it and add it to a gate or fence welding project, or a garden bench, table etc. You can bend the rod and create art projects for the home and garden. 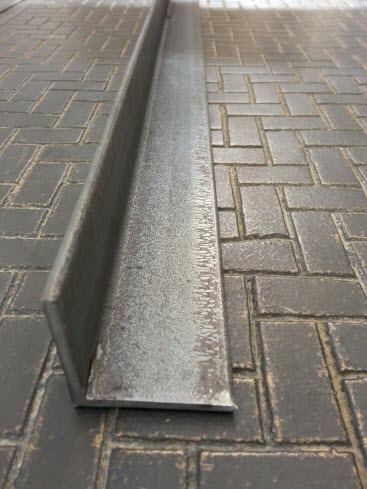 Solid stock is one of the most common types of material used for ornamental and decorative projects but it's also used frequently for bolts and pins or anything you need a solid piece of metal for. Flat bar is used frequently as well. They come in different sizes and thicknesses. You can use these types of material for all kinds of projects as well. For example you can cut shapes out of it, fold it, bend it, or simply use them as cross supports like on the creeper project. Plate is often used for tabletops or a you can use it for a base plate for something. 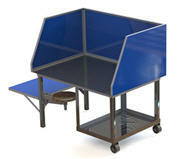 A good first or second welding project could be a welding table. A .5 inch or 3/8 inch plate will work as the table top (some say .25 inch will work but you need to support it). You'll find that sheet metal or sheet steel is handy for many projects because you can make boxes, you can bend it, and you can cut out shapes and create metal art form it. I've seen it used for little bird houses, tool boxes, toilet paper holders, miniature vehicles, medieval armor etc. You name it. The sheet metal above is 22 gauge, 12 inch x 24 inch. Expanded steel has been used as barbecue grates and coverings for windows, and fencing. I've even seen it used on motorcycles to cover up a section on the bike rather than a solid piece of material. It looked very cool. You can also use them as headache racks for your truck. Basically the way it's made is you take a piece of sheet metal, punch holes in it, and then stretch it to make the diamond patterned holes. For whatever reason it's more expensive than sheet metal, but you'll find that you'll need it now and then for different projects. As I mentioned above a good first, second, or third project could be a simple welding table. It uses much of the metal material described above. For example, a typical table will have at least plate, angle iron, 1 inch square tubing, and more depending on the design. I hope this helped you out in understanding the types of material used for simple welding projects. 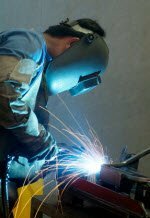 Now that you have a good understanding of the materials why don't you learn more about the tools used for welding.